I approve of your typo--it looks like a place where rabbits go to amuse their people. Very good dissaproving photo. Cute bunny. With that scowl on his face, I'm stayin' outta the way of that one. Bob does have a rather displeased look on his face! Dang, that's a good one handsome Bob! He does have good side eye! Hi Bob, well done :-) Snorgles to you, my friend! I love Bob! What a handsome fella! Bob is a bit bothered, but very handsome! 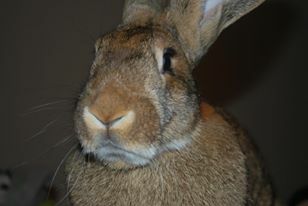 Flemish BOB yur so-o disapproving an so-o hansum!!! Fankss fur stopping bye today!